As a kid kicking around the ‘burbs outside of Boston, Pete always dreamt of becoming a liquid asset manager. After studying Spanish and English, (naturally), he made his way to Vermont, where he worked at a liquor store, in distribution. 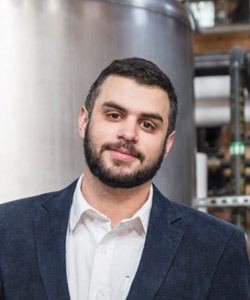 With a growing interest in blending, Pete’s childhood dreams were soon to be realized, when he became a distiller at WhistlePig, working alongside Dave Pickerell. When Pete is not overseeing the sourcing of raw materials, fermentation, distillation, maturation, blending and bottling he can be found taking a long walk on the beach, marveling at glassware, or watching football with his grandmother.